Paul McGann (The Doctor), Eric Roberts (The Master), Daphne Ashbrook (Dr Grace Holloway), Sylvester McCoy (The Old Doctor), Yee Jee Tso (Chang Lee), John Novak (Salinger), Michael David Simms (Dr Swift), Catherine Lough (Wheeler), Dolores Drake (Curtis), William Sasso (Pete), Jeremy Radick (Gareth), Eliza Roberts (Miranda), Ron James (Motorcycle Policeman), Dave Hurtubise (Professor Wagg), Joel Wirkunnen (Ted); Dee Jay Jackson (Security Man), Gordon Tipple (The Old Master); Mi-Jung Lee, Joanna Piros (News Anchors). Returning home to Gallifrey with the remains of his arch enemy, the Master, the TARDIS is forced off course, returning the Doctor into the middle of a street gang's gun battle in downtown San Francisco. The version of the Doctor Who movie originally broadcast in the U.K. was cut by about a minute. The U.K. video release features the same edit than the original broadcast. The Australian release is however an unedited version. A laserdisc version of the movie has been released in Hong Kong in January 1997. No details are known about this release. Commentary by director Geoffrey Sax. Tour of the TARDIS set. New Interview with Philip Segal. to release this DVD outside of the U.K.
LINK: The Restoration Team work for The TV Movie DVD. Paperback Edition - BBC Books. ISBN: 0 563 38000 4. Cover: Photo by Joe Lederer. ISBN: 0 563 40499 X. 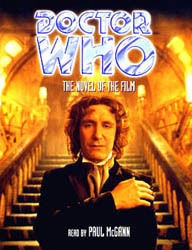 An abridged version of the novel, read by Paul McGann, was released on cassette (ZBBC 1998). 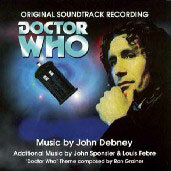 This audio version has been re-released in MP3 format as part of the Tales from the TARDIS - Volume Two collection. Doctor Who Magazine Archive: Movie Special. We see the Master being sentenced by the Daleks: ‘You have been found guilty…’, ‘The penalty is death…’, and then the typical ‘Exterminate! Exterminate!’ A massive shock rips through the Master, and he explodes. The TARDIS is in the time vortex heading back to Gallifrey, dateline 5725.2, in the Rassilon era. A Time Lord has 13 lives and the Master has used up all of his. But rules never meant much to him, as his stealing of Tremas’s body proves. So, even in death, the Doctor tells us, he couldn't trust the Master. The Doctor, still in his 7th incarnation, brings the box of the Master's remains to a counter in an overly large redesigned TARDIS console room -- a gigantic mass of metal, wood and antiques. After placing the remains in a box, the Doctor seals it shut with the sonic screwdriver, comments that that should do it, and then sits in a big plush chair and listens to a record as he has tea and eats jelly babies out of a jar. The Eighth Doctor’s voice says that in all his travels, and now at the end of his seventh life, the Doctor’s only now realising that you can never be too careful. There are many clocks ticking and a few statues. Suddenly, the Master's box splits and cracks open widely with goo falling out of it and sliding into the TARDIS console, causing a critical malfunction. The Doctor runs to the console and tries to right it. He pulls down a scanner screen from the ceiling and it seems stuck on December 30th, 1999 -- a critical timing malfunction has caused the TARDIS to activate an automatic emergency landing fail-safe device that will make the TARDIS land at that time. Checking the box containing the Master's remains, the Doctor realizes his old foe has once again cheated death, and now will be more desperate than ever before. San Francisco, December 30, 1999. Three Chinese boys are running trying to escape from a large dark car chasing them. Another car appears and they run down an alley and jump over a large fence. From the other side, the trio of boys shoot guns at the car, which backs out of the alley. The boys rejoice in their victory, but suddenly four older men with automatic guns stand up from the trash cans. They open fire on the three boys, killing two of them. The third one, Chang Lee, dives for the trash cans on the other side of the alley and dodges bullets. The men play with him, firing just behind and above. He rushes out of the trash to stand against a wall, hands raised in surrender. One of the men tells him to say his prayers. Just as the four men are about to fire, a large blue Police Telephone Box appears in front of Chang Lee and takes the bullets meant for him. The four men are startled and reload just as the Doctor steps out of the TARDIS. As he locks the door, the men decide not to waste their bullets and shoot him and he falls. The four men run off. Chang Lee comes from behind the TARDIS and checks his friends -- they are dead. He hears the Doctor moan and goes to him. The Doctor babbles about a timing malfunction and to stop the goo from coming out of the TARDIS lock. Chang Lee seems sympathetic and will help him, but really has no clue what he’s talking about when he says ‘Stop it…’ his last words before falling unconscious. They hear an ambulance coming already. "Hold on there, old guy, Chang Lee will help you out." The goo forms a puddle. When the ambulance arrives, the goo gets on it. In the ambulance, Bruce, a paramedic, questions Chang Lee, asking if the man is rich -- where they are taking him, he will need to be. Chang Lee needs to sign papers -- a release form -- and writes John Smith as the name of the patient. They arrive at the Walker General Hospital and the Doctor is wheeled out and off into the hospital. The goo has transformed itself into a snake like creature, which wants to follow the Doctor. At the hospital, the resident on duty and two nurses discover that the bullets come out of the Doctor easily and have not caused much damage -- in fact one went through his shoulder and another two went through his left leg. They are, however, amazed at the double hearts in the x-rays of the Doctor. They assume it is a double exposure. Inside the ambulance, the snake goes into Bruce's jacket sleeve. The nurses, meanwhile, realise that the Doctor’s hearts are beating at a rate that would be dangerous if he were human, and decide to call in a cardiologist. On call for Cardiology is Dr. Grace Holloway, who happens to be at the Grand Metropolitan Opera House enjoying Madam Butterfly. She is beeped to the Emergency Room and has to leave her live-in boyfriend Brian. After a bitter discussion on the phone with Brian while preparing herself at the hospital, Dr. Holloway is ready to enter the operating room and asks a nurse to play a CD of Madam Butterfly to relax her. The Doctor's heart is fibrillating at 300, which is dangerous for a human. The Doctor awakens, seeing Grace over him with a scalpel. He urges her to stop, he babbles about himself not being human, and how he is not like her, while fiercely holding her arm. He also asks for a beryllium atomic clock, also saying ‘This is 1999, isn’t it?’ She wants to find out why his heart is going wild and wants to fix it, and says that he’ll be fine. The bullets are out of the Doctor, she tells him, looking into his blue eyes. The Doctor is put under anesthetic and seems totally under; however, he sits up and tells them, "Timing malfunction! The Master -- he's out there!" The nurses and Grace sit him back down. However, just before he goes, he cries out ‘I’ve got to stop…’ Grace doesn't think this guy's name is John Smith. She readies to put a micro surgical probe into the Doctor to explore his heart. While this is going on the hospital's administrator is showing potential investors around. Swift takes them above the operation room to watch Grace work, commenting that she is one of their senior cardiologists. Grace feels déjà vu as she watches where she is probing within the Doctor's hearts, not realizing there are two hearts in the Doctor. She thinks she lost where the probe is supposed to go, and comments that she isn’t where she should be. Another medic says that she could only be where she thinks she is if the Doctor was a donkey. She tries something else but the Doctor has a massive seizure and Grace finds it difficult to pull the probe out of the Doctor; it snaps, part of it inside him. They use an electro resuscitation machine on him. The Doctor sits up again and screams, wide eyed. He falls back and further attempts to revive him, fail. Time of death: 10:03. Grace is upset and wants to see those x-rays. She storms out angrily as a sheet is pulled over the Doctor’s face. While looking at the x-rays, Grace says to Wheeler that the Doctor is to be booked in for an autopsy. Wheeler asks about that kid that brought him in, who might be able to help them since there is no other way to identify the Doctor's real name. Grace doesn't believe the x-ray of two hearts is a double exposure. She goes out to the waiting room to talk to Chang Lee, who asks her if she's the doctor. Grace tells him what happened and tries to console this "friend" of the dead man. Lee takes it in stride and checks a bag of the Doctor's belongings, including the TARDIS key. When Grace realizes Chang Lee didn't know this man at all, the teenager grabs the bag and races out of the hospital into the night. Grace tries to chase him but in vain. 12:50 am. Bruce is asleep in an apartment and his snoring is keeping his wife awake. The snake comes out of his paramedic jacket. The Doctor's body has been toe tagged and is wheeled by into the mortuary. The Doctor is wrapped in a white shroud only. The mortuary overseer, Pete, talks to the body of the Doctor, making jokes and acting like an irreverent fool. He says that he has a nice autopsy booked for the Doctor, followed by a sauna or a massage, here pulling the sheet down and asking the Doctor which he’d prefer. While signing the Doctor in, another medic called Ted reveals he’s going to the New Year’s Eve party as Wild Bill Hicock. The Doctor's body is stored into an ice box room. The Master snake form climbs up onto the bed and into Bruce's open mouth as the man snores. The snake violently shakes into him and moves through his body as if under a sheet. Bruce seems to feel pain and his eyes register what is happening. Then the eyes close as the Master mixes with his DNA, thus acquiring his fifteenth incarnation. In a room adjacent to the mortuary, Pete is watching the movie "Frankenstein" on TV, eating popcorn with his feet up. In the icebox room, the Doctor's sheet is alive with electricity -- his skeleton being seen through the sheet. The sheet falls off from the power surging. The Doctor's face is changing once again, but it seems to be difficult, as though the Doctor is fighting something for this incarnation. It appears to succeed, as the Doctor's arm moves and his hand leans off the table he is lying on, but he isn’t moving. Suddenly, his breath starts up and icy air can be seen spewing from his opening mouth. His eyes open. On the TV, Dr. Frankenstein goes on and on about how his monster is, "Alive! He's alive!" It is 1:15 AM and raining outside with a thunder lightning storm just like in the movie and just like inside icebox. It gets quiet and Pete hears slight banging. Afraid, he goes out to the room where the banging comes from. Pete sees the door of one of the ice boxes bang outward and finally the door fall out and down. The Doctor, the shroud wrapped around him, comes out, trance-like, with a dazed expression on his face. He resembles the body they brought in earlier, but doesn’t look exactly like his previous incarnation. Pete gasps, "Oh my God! God no!" The Doctor moves in closer, as though a bit shortsighted. Pete passes out and falls straight back. The Doctor walks through to the next room where the "Frankenstein" movie scares him as the new Mrs. Frankenstein screams at the Monster and it growls back at her. The Doctor cringes and holds his head. The Doctor walks the halls of the hospital, dizzy, disorientated, and slightly humming ‘Madam Butterfly.’ He hears a crying child. He still has his toe tag on. He walks into a hospital area that is being reconstructed. Rain seems to come in from protective plastic coverings. Water from a broken pipe falls on him, making him cringe some more. The Doctor cries. He turns and sees eight reflections of himself in eight mirrors. The Doctor looks, "Who am I? Who am I?" He holds up his hands and shouts upward, "WHO...AM...I!!!!!" Bruce, now the Master, sits up in bed, green foam and saliva in his mouth. Lightning hits. The Doctor falls to his knees and crumbles up into a fetal position. Grace sleeps into the morning as the sun rises over the San Francisco Bridge. She appears to never have gone home that night. Meanwhile, the Doctor moves to a locker in the hospital and finds a scarf not unlike the Fourth Doctor's scarf, but he discards it. Chang Lee, on the streets, is inspecting the Doctor's bag of belongings and finds the sonic screwdriver. The Doctor finds and discards a Nixon Halloween mask from the locker. Chang Lee finds a yo-yo in the Doctor's bag, along with an oddly ticking pocket watch. The Doctor recalls Ted's costume for the New Year's Eve party: Wild Bill Hicock. He makes a distasteful face at the gun in a belt and drops both; also throwing aside the cowboy hat. He finds a green velvet coat, which he holds against himself and decides he likes. Walking back inside, Grace walks past the bare feet of the Doctor, who, disorientated, is sitting on a couch in the waiting area of the hospital. Looking at Grace, he suddenly has a flashback of staring at her face on the operating table- the first thing he recognises. The administrator asks Grace for some of her time. The Doctor, staring at a clock, whispers to himself, ‘Time…’ and suddenly sees all the clocks back in the TARDIS. Grace talks to the hospital administrator, who burns the x-rays of the Doctor's two hearts, much to Grace's discontentment. She wants to know what that man was, to learn from him. The administrator doesn't want to lose Grace, and believes that without the body or records, nobody need know the Doctor was even here, but Grace wants to find the Doctor's body. He won't hear of it, he won't lose her or the hospital over this. Grace quits and packs her things. When Grace takes her things out of the hospital, the Doctor spots her and at the last moment hops into the elevator with her, standing with his nose just over her shoulder. He stands closer and asks her if they have met before. She doesn’t think so, but he tells her she is tired of life and mentions Madam Butterfly. He follows her out into the parking lot and talks to her as she puts her box into the back of her car hatchback. When she slams the hatchback door shut, the Doctor seems gone. Grace gets into her car and the Doctor is there in the back seat. He is yelling in pain and yells that it’s his hearts. He begins pulling out the probe that was still in him! Before she realized what was happening, Grace beeps her car horn but then sees the Doctor taking the probe out, "I have two hearts! You have to get me out of here before they kill me again. Please… please you have to help me! Drive!" Grace drives off before "they" can kill him again, possibly the inexperienced hospital staff. The Master, in black sunglasses and leather jacket, goes to the emergency room reception to ask about the body that was brought in last night. The woman at the reception tells him it was stolen. "Bruce", really the Master, tells her he had a bad night but wants to find the John Doe or his bag of belongings. She tells him the boy stole the bag. The Master smiles and says ‘The Asian child…’ The nurse calls him sick, to which the Master thanks her. Children run past Grace's home as she brings the Doctor inside. He is better now that a piece of primitive technology is not stuck in him. Brian, Grace's live in boyfriend took all his belongings... and some of her own including her sofa. The two go up steps so Grace can listen to the Doctor’s heart (Or ‘hearts’ as he insists), and the Doctor comments that she has a lovely view from here. Grace is wondering if the Doctor has selective amnesia brought on by shock. He answers he doesn’t know since he can't remember. Grace thinks the Doctor is still fibrillating but he isn't and tells her so, politely. As Grace checks him with the stethoscope, he sees a da Vinci painting and comments that Leonardo had a cold when he painted it. He also mentions being with Puccini before Puccini died... he didn't have a chance to finish his masterpiece of music and someone else had to do it for him. Grace calls the Doctor a “name dropper”. The Doctor is more intent with the romance of it all, "He died before he finished...oh Grace, it was so sad." Here Grace interrupts as she realises that the Doctor does have two hearts, and asks who he is. The Doctor tells her he was dead for too long this time to remember, and the aesthetic almost destroyed the regenerative process. Grace is sceptical, but he tells her he has 13 lives. She tells him that no matter what he says, the dead stay dead and you can't turn back time. He says, "Yes, you can." When she moves away from him, saying that she shouldn’t give any of that crap that only children believe, he turns toward her and tells her that it was a childhood dream of holding back death that was the reason she became a doctor. Shaken, Grace searches for a microscope so she can examine the Doctor’s blood, as he picks up a wooden figurine and says to her, "Don't be sad, Grace, you'll do great things." Chang Lee goes under the police ticker tape to the Rose Alley area where the TARDIS is waiting. He goes inside and after realizing the bigger on the inside than the outside thing, checks the outside and the inside a few times. He moves inside and the doors close. Also inside is the Master who recalls Chang Lee's name. When the TARDIS whistles and starts up, the Master tells the boy that the TARDIS likes him. Chang Lee asks if he is Bruce, the guy from the ambulance last night. The Master tells him that although he looks like Bruce, it took him a minute with the walking and talking thing but he is the Master. He takes off his glasses and his green eyes hypnotize Chang Lee. The Master waves his hand and the boy walks over to him. The Master looks in the bag of the Doctor's. When Chang Lee tells him the man, the Doctor, is dead, the Master hisses, "HE'S NOT DEAD!" He grabs the boy by the throat and moves him over the console. He tells Chang Lee that the man, the Doctor, has stolen his body and they must get it back. Chang Lee is allowed to stand up a bit and asks, "What's in it for me?" The Master taps his cheek, "You get to live." The Doctor tries on Brian's shoes and Grace tells him to keep them while she examines the Doctor's blood which she claims isn't blood, like when the Third Doctor was in hospital after his regeneration. They walk outside to break the shoes in and the Doctor starts to recall some things -- he recalls lying back with his father in the grass on a warm Gallifreyan night. Here he realises that this is where he lives, but Grace hasn’t heard of it and asks what else he remembers. The Doctor recalls seeing a meteor storm, and the sky above was dancing with lights- purple, green brilliant yellow. Here he suddenly cries out that the shoes fit perfectly, causing Grace to just stare at him in bafflement. In the TARDIS, the Master takes out gold dust bags from filing cabinets. He tells Chang Lee the TARDIS was all his but the Doctor stole it from him. He tells the boy that the Doctor and he can regenerate 12 times but the Doctor also stole his body. He also tells him the Doctor was Genghis Khan, and that although he’s no saint, the Doctor is pure evil. The TARDIS likes Chang Lee, the Master tells him, and allows them entrance into the giant cloister room, a room complete with live bats. The Eye of Harmony is here and it is the device that powers the entire TARDIS, power from the heart of the structure. If they can open it, they can find the Doctor. The Master makes Chang Lee pull the staff out of its mooring and this opens the eye a bit. If he looks into the beam of light and the TARDIS really likes Chang Lee, it will open the Eye totally. The Master forces a suspicious Chang Lee to look into the beam of blue light to open it fully. The Doctor seems to feel this, crying out that something is happening. Yet he now knows who he is and excitedly tells Grace, "I know who I am!" He kisses Grace while she has her back to a tree, and they move around to the other side, as he cries out ‘I am the Doctor!’ Grace says that's good, and then asks him to kiss her again. He does. The Master and Chang Lee in the cloister room of the TARDIS are looking into the Eye and see an image of the 7th Doctor, which Chang Lee recognizes. They then see the image of the new Doctor eating a jelly baby. The pair also see the retinal structure of the human eye. The Master just realizes, "The Doctor is half human. No wonder." The Doctor is still kissing Grace but pulls away, realizing the Eye of Harmony is open. He panics, crying that he felt the presence of the Master, who is planning to take the Doctor’s body. Chang Lee and the Master see Grace's face, knowing that they are seeing what the Doctor is seeing. Chang Lee recognizes Grace, but the view suddenly vanishes as the Doctor shuts his eyes. The Doctor is in pain and tells Grace that the Eye of Harmony is the power source at the heart of the TARDIS, which is his ship that carries him through Time and Space. Grace asks if the Master is like the devil, to which the Doctor replies that the Master is a rival Time Lord, whose remains he was talking back to Gallifrey from Skaro after his final incarnation had died, or so they thought. Here he grabs Grace, who is beginning to think the Doctor is mad, and says that the Master isn’t dead and has set up a trap. He wants the Doctor to look into the Eye of Harmony, and if he looks into the Eye of Harmony, his soul will be destroyed allowing the Master to steal his body and inhabit it for his own life. Furthermore, if the Eye isn't closed by midnight, the planet will be sucked through it. In order to stop it the Doctor must fix the timing mechanism on the TARDIS with a beryllium atomic clock. This is too much for Grace and she runs to her house. The Doctor calls to her, finally daring to open his eyes. The Master laughs and tells the boy they need to find the Doctor before the Doctor finds a clock. The Doctor returns to Grace's house but finds himself locked out. He asks for her to let him in. Grace says that the Doctor is way lost for a Time Lord, and he says that he is a Time Lord, to which Grace says that she thought he was a Doctor, and the Doctor replies with the same. Grace calls for an ambulance and to get the Doctor a bed in psychiatric. 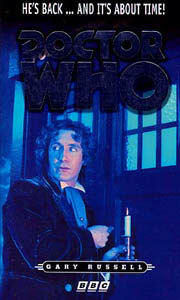 The Doctor looks through the window, then the door slot, and then goes to the long glass doors. He tells her if they don't stop this from happening this planet will no longer exist. The Doctor shows her what he says is the truth by sticking his hand through the molecules of the glass and then walking through it, leaving the glass unharmed. The molecular structure of the planet is already changing, he explains as he enters, and by midnight tonight the planet will be pulled inside out. Grace falls to her knees and calls for two beds in psychiatric. The Master and Chang Lee will be in the ambulance that arrives. The Doctor checks his weight -- he has lost 20 pounds in 20 minutes. The Doctor shows Grace a news report on TV -- the tides are rising at record amount, it is snowing in Hawaii, and there are other strange things happening. When the newswoman reports that scientists are blaming the fluctuation of Earth's magnetic pull that happens only every thousand years, the Doctor laughs, sincerely, "I love humans. They're always seeing patterns in things that aren't there." The two of them see a report about the atomic clock at the Institute of Technological Research and Advancement -- a beryllium clock. The ambulance arrives -- it is the Master with his shades on. The Doctor opens the door to him and asks if he knows where the Institute is. The Master smiles, "Of course I do." Grace is on the board of trustees at the Center of Technological Advancement and Research so that should help once they get there but in the ambulance she tells the EMT (really the Master) she wishes he could give the Doctor a sedative. During the discussion, the Doctor reveals he met Sigmund Freud and knew Madam Curie intimately. Grace still doesn't believe the Doctor's story, even sarcastically asking if Madam Curie kisses as good as she does. The ambulance hits a bump and the Master's glasses fall off, giving the Doctor a glimpse of his green eyes. As the ambulance gets into a traffic jam, the Doctor pulls off the shades, causing the Master to spit out his goo, some of which gets on Grace's wrist as she shields her face. The Doctor shoots the Master with a fire extinguisher and pulls Grace out the back. Chang Lee comes in and helps the Master. The Doctor and Grace run into a traffic cop who just got off his motorcycle. He stops them and won't let them go any further. Grace tries to explain the Doctor's oddness by telling the cop, "He's British." The Doctor gives the cop a jelly baby to eat, while doing so, also taking the gun from the policeman, threatening to shoot himself if he won't let them go. He asks Grace if she is with him, telling her he held back death, and he can’t make her dream come true forever, but he can do it today. The Doctor gives Grace the gun and she shoots the radio on the cycle and gets the cop's keys. Chang Lee is held up in traffic but the Master points out that they are in an ambulance. They proceed toward the Doctor and Grace, who take off on the motorcycle, Grace dropping the gun as the Doctor kick-starts the bike. During the chase that follows, the Doctor heads the cycle between two trucks, "Breathe in, Grace!" Chang Lee takes the ambulance another way, knowing a short cut. The Master wants to get the Doctor's body at the clock. Chang Lee almost gets in trouble when he tells the Master, "You kill me." He thinks the Master was being funny. The Doctor is still driving like a maniac, passes cars, goes down a hill, up to another road, past a man repairing his tire, all of this prompting Grace to remember she only has one life... She now believes his story, commenting that it’s just great that she finally met the right guy and he was from another planet. The pair of them get to the centre but find the ambulance and the Master have arrived first. Grace introduces the Doctor as Dr. Bowman from London but a guard has no intention of letting them up to see the grand year 2000 atomic clock. The Doctor needs only a tiny part of it to fix the TARDIS and close the Eye. Making small talk so as not to alarm the guests, Grace asks if time travel is possible, the Doctor tells her anything's possible. He has a secret he is about to tell Grace but Dr. Wagg, creator of the clock, arrives between them. He will not hear of allowing "Dr. Bowman" and Grace closer to the clock. The Doctor asks him to bend the rules and tells Wagg his big secret -- "I’m half human, on my mother's side." As he tells Wagg this, he lifts his pass from him. At the clock, the Doctor wishes he had his sonic screwdriver. He removes a small square, prompting Grace to comment about good things in small packages, a saying on the Doctor's planet, too. A young guard watchman arrives and the Doctor knows him. He knows his name is Gareth and that on his mid terms, Gareth should answer the second question- the third may look easier, but he’ll flunk it. Gareth asks to see what is in the Doctor's hand and it turns out to be a jelly baby. Gareth is given it and eats it. The Doctor and Grace go. Grace asks what that was all about. In ten years, Gareth will head seismology and discover how to predict earthquakes, saving the human race several times over; he will also try his hand at poetry. From the balcony back down, the Doctor and Grace see Chang Lee and the Master among the guests. They run down a hall and find four gun pointing guards covered in dripping Master slime. One falls and his gun goes off. The Doctor and Grace retreat to a small room, an exit to a fire escape. The Doctor pulls a fire alarm to liven things up. Grace uses a fire axe to block the door while the Doctor grabs a hose and asks her if she is afraid of heights. She answers she is. He tells her, "So am I." They climb a ladder and go over the roof using the hose. The Master and Chang Lee break into the small room. The Doctor and Grace land on top of a police car and get off, go to the cycle, and take off, Grace telling no one in particular, "Here we go again." On the cycle ride, Grace asks about her future but the Doctor won't tell her -- he can't meddle with the delicate threads of the universe. Grace just wants some pointers. They ride to the TARDIS where the Doctor keeps a spare key in a cubbyhole just above the ”P” in Police Box, a form he explains is due to a stuck cloaking device which got stuck in on a previous misadventure. A motorcycle cop, chasing them, has lost his brakes and when the door is open, he rides right into the TARDIS, turns inside it, and rides out again. Going into the TARDIS, they hear the cloister bell, signalling the TARDIS is dying. There is no auxiliary power but the chip they stole will help. Grace calls the console low tech but the Doctor explains that this is a Type 40 TARDIS, capable of taking them to any planet in the universe at any date in that planet's history. She is told it is temporal physics and she guesses interdimensional transference, which is why they felt the displacement coming over the threshold upon entering. The eye closes and it is 11:48. Something is still wrong so the Doctor opens the ceiling roof scanner dome. They look at one minute after midnight -- there is no future -- the eye was never opened before by the Doctor. Grace suggests going back before the eye opened but they do not have the power. She asks him not to give up -- what about her future, Gareth's future. He asks her about setting alarm clocks, which she is not good at. He figures a way to "jump start" the TARDIS by channelling the energy from the Eye directly to the console. The Doctor sets to work under the console and Grace hands him tools. He asks her for the neutron ram but she hits him with it. The Master and Chang Lee are inside the TARDIS and approaching, seeing this. Grace's eyes are black, the slime from her wrists having infected her. Chang Lee and Grace wheel the Doctor on a gurney he is strapped to. The Doctor tries to reason with Chang Lee but Grace slaps the Doctor. The Doctor realises that Lee believes that the Master owned both the TARDIS and the Doctor’s body originally, and that both were stolen. Despite the Doctor’s arguments that money will be no good to Lee once the Earth is destroyed, Lee doesn’t listen. The Master descends the steps in the TARDIS in full Time Lord dress, "I always dress for the occasion." Flamboyantly, he counters the Doctor's arguments and kisses Lee, telling the Doctor that Lee is "the son I have always yearned for." The Doctor tries to tell Lee the truth while the Master makes Grace put on a metal band of nails onto the Doctor's head, that the TARDIS has always been his and he is in his own body, and Grace is possessed by evil, not good. It has been several hundred years since anyone has ever opened the Eye of Harmony, and the Master has only opened it because Lee is human, and the Doctor is only half. (Possibly caused by when the Sixth Doctor had Evelyn’s eye print programmed onto the retinal scanner during the Dalek invasion of Gallifrey perhaps?) The Master and the Doctor debate. The Master plays on the fact that Lee no longer has anything here, no gang, no family, but with him he gets to see the Universe. The Doctor cries out that this is Lee’s last chance to stay alive. The Master asks’ what the Doctor knows of last chances, to which the Doctor replies ‘More than you!’ Here the Master loses his cool in the debate and slips up, saying he has used up all his lives because of the Doctor (The Master was in his first incarnation when the Second Doctor trapped him a black hole and was on his twelfth when the Third Doctor met him, so it took him all but one regeneration to escape.). The countdown to midnight has begun while Grace re-wires the console, as she comments that she thought surgery was difficult. The TARDIS comes alive thanks to her and vanishes with a blast of power and moves into a temporal orbit. Grace doesn't know what that means so she runs back to the Doctor as The Master's life force begins to die as the Eye returns the Doctor’s regenerations to him. Grace starts to free the Doctor but the Master comes to them and tosses her off the balcony, killing her. The Doctor manages to kick the Master away from him, free himself, and race down to Grace, whom he finds dead, to his horror. The Master looms up behind him with the staff of light and attacks the Doctor, hitting and kicking him around. They fight over the Eye eventually and the Master tries to force the Doctor into it. The Doctor cries to the Master ‘You want dominion over the living, yet all you do is KILL!’ The Master, but with a very husky voice, replies ‘Life is wasted on the living!’ The Doctor breaks free as the TARDIS shakes and uses the staff of light to distract the Master as the Master jumps-dives at him. The Master ends up holding onto a pole around the Eye, hovering over it. The Doctor puts out his hand to help the Master but the Master won't take it and falls into the Eye, the power whirling him about as he calls for the Doctor. Time reverses from 12:00am on December 30th to 11:59pm on December 29th. The Doctor carries Grace to a leaf covered landing and lays her next to Chang Lee's body. The Eye has life force emit from it and it goes into the two dead humans. They awaken, Chang Lee telling the Doctor he has his things. Grace and the Doctor hug and the Eye closes, the Doctor telling her the TARDIS is a sentimental old thing. Grace tells the Doctor that death is nothing to be scared of. Both she and Chang Lee have been somewhere he hasn't. When asked if they’ve gone back far enough, the Doctor says either that or he’s talking to ghosts, and he doesn't believe in ghosts. They are in the future now and look at the stars over the sky scanner and see Gallifrey, which is 250 million light years away- a good ten minutes in the TARDIS. Apparently the Eye or the TARDIS have consumed the Master and gotten indigestion from him. The console goes to December 29th and then the 31st at the Doctor's movements over it. Suddenly, it stops. The Doctor makes a fist and lightly bangs it. It goes on again. At a party, a man makes fun of Pete by dressing as a shroud that came to life (the Doctor). It is New Year's Day at 12:00am now. Year 2000. The TARDIS appears in a San Francisco park near a man made lake and the trio emerge. Lee gives the Doctor his bag and the Doctor delights at his sonic screwdriver. The Doctor tells Lee to keep the gold dust and that next Christmas Lee should take a vacation, "...just don't be here." Lee catches on and thanks him and says goodbye to him and Grace. Grace wonders if that is more interfering. It is. He starts to warn her about something, "Grace, there's something you should know..." Grace stops him, saying that she knows who she is, and that’s enough. He asks her to come with him, but she asks him to come with her. He calls that offer tempting. The two of them kiss amid the fireworks in the night sky. The Doctor goes and the TARDIS vanishes. The Doctor suddenly believing he’s half human might not have been true before now, and it could just be that residue human DNA from Dr John Smith in Human Nature caused this change. The Seventh Doctor was sent to collect the Master’s remains by Romana, as revealed in Lungbarrow. The Eye of Harmony’s operating only to human eyes could have something to do with when the Sixth Doctor and Romana programmed Evelyn’s eye print onto the retina scanners of Gallifrey during the Dalek invasion in The Apocalypse Element. 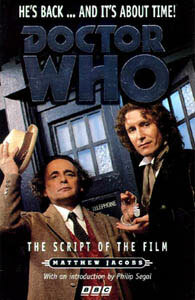 The Master’s claim that the Doctor has made him waste all his lives is justified, since when the Master (Then Koschei) met the Second Doctor in The Dark Path, he was on his first life, but when he appeared in Terror of the Autons after escaping the black hole he was trapped in then, he only had one regeneration left, so he used all but one life to escape the hole. The Doctor, Fitz and Sam shall later experience the after-effects of this battle when they arrive in San Francisco in Unnatural History. Exactly how the Master is able to turn into a snake after death in revealed in The Eight Doctors.